Max Verstappen’s name no doubt sounds familiar, as his father Jos was a popular F1 racer in the late 1990s. With a motorsport heritage behind him, Max made his debut as F1’s youngest ever driver during a Friday practice session in 2014. The Dutch driver was signed as a race driver for Toro Rosso in 2015 and immediately impressed with close racing and a mature attitude. After just a handful of races in 2016, Max was promoted to the Red Bull team in a direct swap with Daniil Kvyat. The Verstappen name is well known in F1 circles, but Max represents the latest generation to enter the sport. With a karting mother and a single seater racing father, there could only be one choice of career for the Belgian driver. He started karting, winning several of the Belgian and Dutch championships that he entered. He was on the path to making an impression in single seater racing, testing a Formula 3 car in December 2013, and joining the Formula 3 championship for the following season. 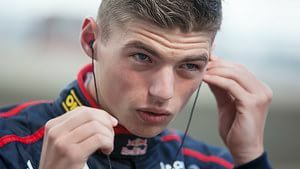 Partway through 2014, it was confirmed that Verstappen would race for the Toro Rosso Formula One team the next year, becoming the youngest ever F1 driver to do so. He took that record earlier than planned, however, when he participated in Friday practice during the Japanese Grand Prix of 2014. After impressing the bosses, Verstappen was signed to Toro Rosso for the 2015 season, alongside Carlos Sainz, Jr for a double rookie line-up. Despite a rocky season, Verstappen continued to show well, outperforming his teammate and proving a formidable overtaker during each and every race. The same driver lineup was retained for 2016, but Verstappen was about to get a promotion. After four races, he was given the call up to the Red Bull main team, swapping seats with Daniil Kvyat who was being demoted after collisions in the previous two races. Once in the main seat, Verstappen was immediately impressive. He was fearless about overtaking other cars, and although occasionally rubbed the more established names up the wrong way, continued with his aggressive style to pick up one race victory, six other podium finishes, many driver of the day plaudits and the general respect of everyone watching. It was no surprise for him to be retained alongside Ricciardo for the 2017 season, with the pair set to do battle as the competition heats up. Learn more about Max Verstappen with the Pocket F1 Handbook. Max Verstappen wins the Mexican Grand Prix!Lewis Hamilton wins the 2017 World Championship! Team radio from Max Verstappen: "So on the braking, left front is giving up a bit." Lap 1, turns 2 and 3 incident involving Sebastian Vettel, Max Verstappen and Lewis Hamilton - no investigation necessary. Lap 1, turn 2 and 3 incidents involving Sebastian Vettel, Max Verstappen and Lewis Hamilton noted. Some last minute engine penalties have affected the grid today, with Daniel Ricciardo dropping out of the top ten. Sebastian Vettel starts on pole, though, having denied Max Verstappen his first ever F1 pole position by just 0.086 seconds. 5 second time penalty for Max Verstappen - leaving the track and gaining an advantage. Turn 17 incident involving Max Verstappen under investigation - leaving the track and gaining an advantage. Bottas has now dropped into the clutches of Max Verstappen. Max Verstappen has come into the pit lane, an unexpected second stop from the Red Bull.